In this Sept. 18, 2016 file photo, David Benioff and D.B. Weiss accept Outstanding Writing for a Drama Series for 'Game of Thrones' episode 'Battle of the Bastards' onstage during the 68th Annual Primetime Emmy Awards at Microsoft Theater in Los Angeles, Calif.
A social media campaign to derail HBO's planned modern-day Southern slavery drama quickly caught fire, prompting the cable channel to ask detractors to withhold judgment until they see "Confederate." The campaign, with "OscarsSoWhite" activist April Reign among its organizers, asked people to tweet to HBO with the hashtag "NoConfederate" during Sunday's broadcast of the channel's "Game of Thrones." "Game of Thrones" is produced by David Benioff and D.B. Weiss, who are developing the recently announced "Confederate." The pair, who are white, will work on "Confederate" with husband-and-wife Malcolm Spellman ("Empire") and Nichelle Tramble Spellman ("The Good Wife"), who are black writer-producers. Reign tweeted Sunday night that #NoConfederate rapidly shot to the top ranks of Twitter both nationally and internationally. It didn't take long for HBO to respond to the campaign that amplified earlier criticism of the project. "We have great respect for the dialogue and concern being expressed around 'Confederate,'" the channel said in a statement. "We have faith that Nichelle, Dan, David and Malcolm will approach the subject with care and sensitivity. The project is currently in its infancy so we hope that people will reserve judgment until there is something to see." In announcing "Confederate" earlier this month, HBO described the story as following "a broad swath of characters on both sides of the Mason-Dixon Demilitarized Zone," including freedom fighters, politicians, abolitionists and executives of a slave-holding conglomerate. A backlash quickly followed, including from writer Roxane Gay ("Hunger," ''Difficult Women"). Her July 25 opinion piece for The New York Times carried the headline, "I Don't Want to Watch Slavery Fan Fiction." "It is curious that time and again, when people create alternate histories, they are largely replicating a history we already know, and intimately," Gay wrote. "They are replicating histories where whiteness thrives and people of color remain oppressed." "File this under, 'hindsight is 20-20,'" Bloys told a TV critics' group. HBO was misguided in putting out a press release instead of having the producers explain the idea more fully in media interviews, he said. The show won't be "whips and plantations," Bloys said, but will draw a line between America today and its past as it tries to advance the discussion on race relations. The more producers can weigh in about why the project is important, the more it will make sense, Bloys said. But an interview the show's creative team gave after the initial outcry failed to stem the #NoConfederate campaign. In comments to the website Vulture, Nichelle Tramble Spellman said that the drama isn't going to be "the big 'Gone With the Wind' mansion." 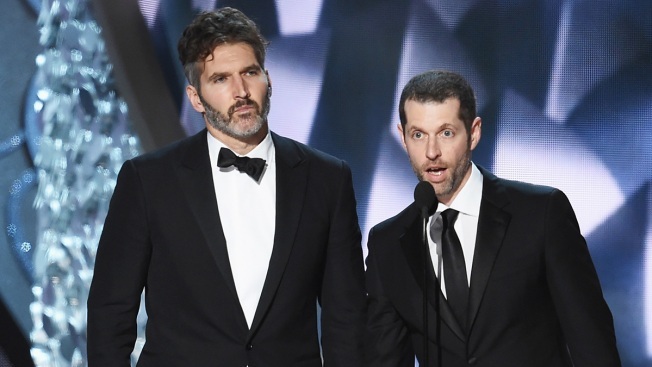 "Confederate" isn't expected to start production for at least a year, Bloys has said, noting that Benioff and Weiss are working on the final season of "Game of Thrones," with the premiere date yet to be settled. The fantasy drama's seventh and penultimate season just began showing.